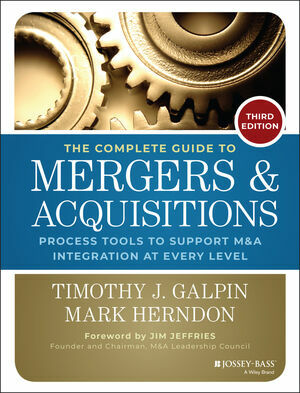 The Complete Guide to Mergers and Acquisitions is the ultimate handbook for planning and managing post-merger integration. Packed full of "how to" guidance, tools, templates and resources that have been put to the test on numerous due diligence and integration efforts around the world, The Complete Guide to Mergers and Acquisitions has been the go-to guide for firms seeking to maximize the value of their deals since the release of the first edition in 1999. TIMOTHY GALPIN, PhD is a Clinical Professor of Management at Colorado State University teaching Strategy and Entrepreneurship. His consulting, research, and publishing are in the areas of Mergers and Acquisitions, Leading Sustainable Organizations, Leadership Effectiveness, and Entrepreneurship. Prior to his teaching, Tim gained over 20 years of experience as a management consultant and business manager working with boards and senior management around the world on strategic planning, strategy execution, merger and acquisition integration, divestitures, restructurings, human capital management, business productivity improvement, and organizational culture change. He still consults to firms on these topics. MARK HERNDON serves as president of M&A Partners, where his practice includes M&A integration strategy and management; building internal M&A capabilities for corporate acquirers; due diligence; culture assessment and integration; and change management, communications, and leadership during periods of disruptive change. Previously, he was president of Parkwood Advisors and U.S. Region Leader for Merger and Acquisition Services with Watson Wyatt Worldwide. Mark also serves as chief knowledge officer for the M&A Leadership Council and as a board director for various private companies and faith-based and charitable organizations. He has presented keynote addresses and concurrent sessions to nearly 400,000 people and is the author of a popular weekly newsletter, Merger Monday Insights, available at www.mapartners.net.